As helpful as some people can be, there are still some that will turn their heads when someone else is in distress. However, there are others who are willing to lend a helping hand, no matter how long it takes for their efforts to make a difference. Paula was living a happy life without a concern for financial or social problems. It was just her, her family, and her friends, constantly sharing laughs with one another. Married for almost 30 years, Paula had everything set for herself, and she knew that her life in Somers Point, New Jersey was going to be a thrilling one. Paula was in the bathroom cleaning everything up, from the sink to the floor to the shower. She wanted to keep her family’s home clean and beautiful, the way she sees it. She had her ring on that her husband, Michael, bought for their 20 year anniversary. The golden ring with diamonds crusted across was something she would cherish… but not for long. Paula’s heart skipped a beat as soon as she noticed that her left ring finger felt a bit lighter. She slowly looked down at her ring finger, hoping that her treasured anniversary gift is still on it. She was horrified to see that it was gone. She didn’t notice that she flushed it down the toilet. After finishing her clarification, Paula wiped away her tears and waited for Michael to say something. She thought he was so overwhelmed by anger and frustration that he couldn’t say anything. However, his face didn’t show any anger. Suddenly, he interrupted the silence by letting out a small chuckle. Paula was completely shocked by Michael’s reaction to the situation. She told him that she lost the wedding ring he bought for her to celebrate their love, and here he was now laughing. After he finished laughing, Michael made fun of Paula for her clumsiness and decided to buy her another wedding ring, exactly like the one she lost. Fast forward seven years, in the same house. Even though the incident took place a long time ago, Paula still very much ached for the missing artifact every single day. Although she felt an unbreakable attachment with the ring, her hopes of finding it were still high. Determined to rediscover it, Paula contacted Ted, the chief of the city’s public works crew. When opening the door, Paula Stanton greeted Ted Gogol and asked what he needed. Then, without saying a word, he revealed the long lost ring to her. Paula’s eyes immediately picked out the features, and found her initials carved on the side. This was her ring. At that moment, she felt as if she was going to faint. “Everyone was in a state of shock. I was hugging him and crying,” Paula Stanton said. “I was calling my kids and telling people about it. My family had a difficult year, and for this to happen …” Needless to say, it was an early Christmas miracle that nobody was expecting. 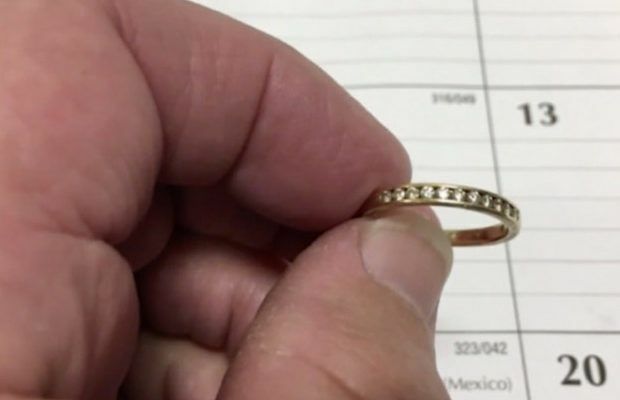 “That ring didn’t want to leave her family,” Ted Gogol said. “There are so many things that could have happened. It could have been washed away, it could have been crushed, but it was just meant to be.” Paula now wears her original ring with her replacement ring, showing just how special her marriage with her husband really is to her. After nine years, Paula Stanton finally feels complete again.